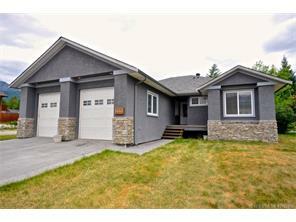 Quality built home in the beautiful Bears Paw Heights development. Want to live in an area with good access to biking, walking trails, and nice mountain views? This is it! Family friendly floor plan with a master and full ensuite on the main, plus a walk in closet. There is access to a deck via the kitchen in the backyard which is ideal for entertaining when family and friends visit. The double attached garage will keep your cars warm in winter and you won't have to scrape windows! Call your REALTOR@ quickly before somebody else beats you to it.